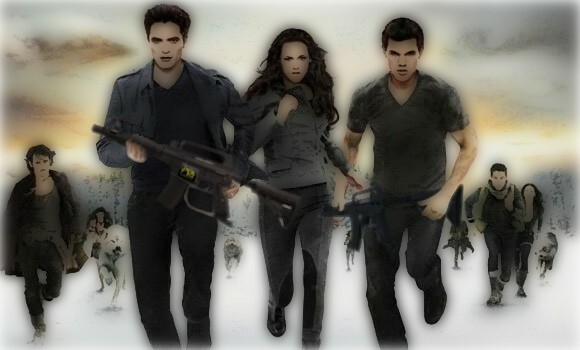 As many young paintballers might know, the Twilight Breaking Dawn Part 2 movie was released in cinemas this month – the final film in the Twilight saga. Many are intrigued by how it’s all going to end, but what we’re keen on knowing is what would happen if the Vampires and the Werewolves decided to settle their differences with an ultimate game of paintball? Who would win? Of course in ‘Breaking Dawn Part 2’ we saw Team Edward and Team Jacob put aside hundreds of years of differences and unite for one battle against a common enemy – the Volturi. But what would happen if the truce didn’t last and it was once again Vampires vs Werewolves? You may be thinking… how would a Werewolf hold a paintball gun? But in this imaginary battle we imagine it’s completely possible. We all know vampires are extremely strong and fast, but werewolves are faster and stronger and they have the advantage of being pack hunters – so rarely hunt alone. To their credit, vampires are extremely agile and this would give them the edge to be able to dodge paintballs travelling at 100mph. Vampires wouldn’t need our custom body armour as they have super tough skin that can only be penetrated by the teeth of Werewolves. To make the game as fair as possible, we shall arm each team with the latest M16 paintball machine gun and smoke and paint grenades for diversion tactics. Despite their natural defense mechanisms, both vampires and werewolves would be required to wear our fully approved full head goggles to protect their eyes. The werewolves would need a set of custom goggles to fit over their bigger skulls – perhaps a JT half head goggle would be better suited? But which game zone would be best to test their abilities? A werewolf certainly can’t fit in a London bus! Castle Wallenberg may be named with wolves in mind but it certainly wouldn’t be fair to let the vampires hide high up in castle in key positions. Perhaps ‘Viet Cong Village’ is a better option. It would be exciting to see who can hold the most jungle huts and guard towers – a game of teamwork and stealth. The werewolves’ ability to read each other’s thoughts would certainly give them the advantage – but it’s common knowledge that Edward can read thoughts too! …and how well would The Terminator do in this battle? Perhaps he’s met his match!